A former surfer designs a buoy that can convert wave motion into electricity. (FSB Magazine) -- If you wanted to choose the perfect location for capturing the ocean's energy, you couldn't do much better than the Oregon coast. Waves arrive there with immense power, having traveled across thousands of miles of open water with few barrier islands, reefs or other obstructions to slow them down. Some are so large that they can be tracked by Satellite days before they arrive. Starting in 2007, those massive, ceaseless waves will help light homes and businesses along the West Coast, thanks to an entrepreneur named George Taylor. A former surfer who grew up in Australia, Taylor, now 72, studied electrical engineering and spent the past 40 years as a small-business owner in the U.S. His most recent invention is a buoy that can convert a wave's up-and-down motion into electricity, which can be carried ashore by undersea cables and fed into the national power grid. The buoys get deployed a mile or so offshore, either individually or linked together in a field of a dozen or more covering 30 acres of the ocean's surface. They are also an environmentalist's dream - barely visible from the beach, drawing on an abundant, renewable energy resource, with little or no impact upon marine life and emitting no gases that contribute to global warming. A handful of competitors are designing similar wave-power systems, but Taylor's company, Ocean Power Technologies (Charts) , based in Pennington, N.J., is the furthest along, say experts, with working prototypes in the water and generating power off several countries. According to Roger Bedard, a researcher for the Electric Power Research Institute (epri.com) in Palo Alto, the research and development arm of the electric utility industry, no other U.S. company is close to matching OPT's progress. The company, founded by Taylor and a business partner, Joseph Burns (who died in 2001), began operations in 1994 and now employs 35, with about $5.4 million in annual sales for 2005. But if the project in Reedsport, on Oregon's central coast, pays off, that revenue number could grow substantially. "The market is huge, and the world will spend $200 billion on new generation equipment over the coming decades," Taylor says. "In 20 years China alone will be consuming all the energy that the entire world uses now." Buttressing Taylor's optimism, researchers at Oregon State University say that only 0.2 percent of the ocean's untapped wave energy could power the entire world. This figure may seem incredible, but water is a very dense medium, about 1,000 times thicker than air, and capable of transmitting immense energy when in motion. What's more, about 60 percent of the world's population lives within 40 miles of a coast. The buoys Taylor plans to install off Oregon in 2007 will generate electricity at rates competitive with that produced by coal - currently the cheapest, most abundant, most commonly used (and dirtiest) source of energy, at about 4.5 cents a kilowatt hour. Future generations of the buoys could conceivably produce power more cheaply than that. "Timing is critical in life, and for once the gods have been good to us," Taylor says. "Climate change, $60-a-barrel oil, dicey relations with oil-producing countries - I hate to put it this way, but suddenly wave power is looking good." Five years later Taylor and his partners sold their company to Fairchild Semiconductor, a forerunner of Intel (Charts). Taylor and Burns started consulting for small and large engineering companies, helping them get products out of the lab and into the hands of consumers. But the pair still had the urge to create something of their own. With the energy crisis still fresh in everyone's mind, they started exploring alternative energy sources. The duo initially considered wind power, which at the time was the most mature proven technology and is still considered highly promising. But they foresaw a number of problems with wind, especially on the scale needed to generate commercially significant electricity: Wind is unpredictable and often intermittent, and generally requires big, unsightly turbines (though the technology has improved since then - see "Your Own Windmill"). By comparison, waves are abundant and predictable. Moreover, technology for a buoy system could piggyback on some of the innovations developed to support offshore oil platforms. From their previous startup experience, Taylor and Burns knew that they wanted investors willing to think long term about Ocean Power's plans. They decided to avoid venture capitalists, who "think in time frames of five years or less," Taylor says. "Instead we wanted friends, wealthy individuals, and customers with long-range goals who were willing to be strategic partners for ten to 15 years." The company also received early-stage financing from an electrical-components maker and a small energy company in Australia. Because there was so little enthusiasm for alternative-energy investments in the U.S., even as recently as a few years ago, Taylor had to take the company public on the London Stock Exchange. (Britain is far ahead of other countries when it comes to funding and research in wave power, thanks to more than a decade of generous government subsidies, capital grants, and a long, wave-tossed coastline.) Ocean Power's October 2003 IPO raised $40 million, at a time when interest in the U.S. was almost nil. The company has tried to perfect its technology on a small scale and then make it bigger. Ocean Power launched its first experimental buoy off the New Jersey coast in 1997; about six feet tall, it was capable of generating one kilowatt. Last year Ocean Power installed a 40-kilowatt version in 100 feet of water nearly a mile off the Hawaiian coast to provide supplemental power for the U.S. Navy. That project - a contract worth about $7 million - is still expanding. Five more buoys are to be installed, each progressively larger, in a field that will ultimately generate as much as one megawatt of electricity, or enough to power as many as 1,000 homes. "They were a good customer and a good learning experience, because they know all about how to deal with the ocean and its demands," Taylor says. "If they know how to anchor an aircraft carrier, they're going to know how to anchor a buoy." The Navy enlisted an outside firm, Honolulu-based Belt Collins (beltcollins.com), to assess the environmental impact of the buoys. It found that the problems environmentalists had feared - marine mammals getting entangled in the mooring line, or electrical faults disrupting sea life - did not occur. If anything, the undersea cables and anchors provided a place for coral to grow and attracted fish, much like an artificial reef. Similarly, there were no effects upon currents or wave patterns, no electromagnetic disturbances, no heat generation, and no undersea noise to disturb sea creatures. The buoys used in the Reedsport, Ore., project will be Taylor's biggest yet - 30 feet wide, weighing 50 tons and capable of generating 150 kilowatts each - but they work the same way. Looking like a typical navigation marker, each buoy houses a massive float that moves up and down like a piston as a wave passes. (As with an iceberg, most of the buoy remains below the water, with only about nine feet projecting above the surface.) The piston's motion drives a generator near the top of the buoy that creates an electric current, which is then piped back to shore via undersea cables. 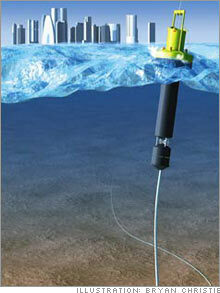 It sounds simple enough, but the key lies in the buoy's sophisticated sensors. No two waves are identical, so sensors measure each wave in the first tenth of a second as it passes, and an onboard computer "tunes" the buoy, adjusting the travel and resistance of the piston mechanism to capture as much of the wave's energy as possible. The system can even automatically lock and unlock the piston, protecting the buoy during storms. OPT holds 28 patents on the technology, with 16 more pending. There is widespread support in Reedsport for such a project, judging from a series of town meetings covered by the local newspaper, the Newport News Times. The town has been suffering economically since the paper mill closed, and an EPRI analysis estimates that a project of this type could provide as many as 150 jobs during construction. Some locals worry that the buoy system could harm the local Dungeness crab population, but early studies haven't shown that to be a problem. And at least one Reedsport fisherman gives Ocean Power's buoys a cautious endorsement. Bob Eder, captain of the 66-foot crab boat Michele Ann, says, "How can any citizen be against clean, nonfossil energy? Even as a commercial fisherman, I can see the benefit of this project." But, he notes, as part of "the most successful sustained crab fishery on the West Coast, of course we want to be careful to protect it and everything else in the related ecosystem." For his part, Taylor is still thinking bigger. By the year 2010 he plans to have a 100-ton, 37-foot-wide buoy that could generate 500 kilowatts, a size that he calls the "magic number," because that's the point at which substantial economies of scale kick in. An array of 40 buoys that size, linked together, could generate electricity at prices significantly less than that of a typical coal-burning power station, and far less than the price at plants that burn more expensive fuels such as natural gas. Clean electricity that cheap could be used to desalinate seawater, split water molecules to make hydrogen for fuel-cell cars, or provide inexpensive power for other ambitious, energy-hungry projects. Taylor's voice drops off as he dreams of the possibilities. "It's a very exciting thing to come late in one's career," he says "It keeps me young."